Our trips are lightly scheduled. Plenty of freedom for you to explore, making your own way through these remarkable places and returning to the warmth of dinner and good wine with friends. Together, like family. 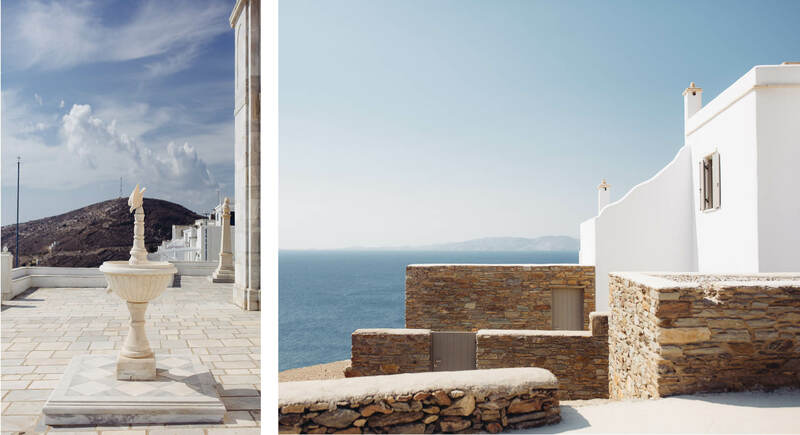 Tinos is stark beauty in a duochrome of white and blue. In this quietest corner of the Cyclades, the dream of Greek island life moves slowly, in stone and wind, down long, winding roads, past ancient dovecotes and tumbles of sugar cube houses. 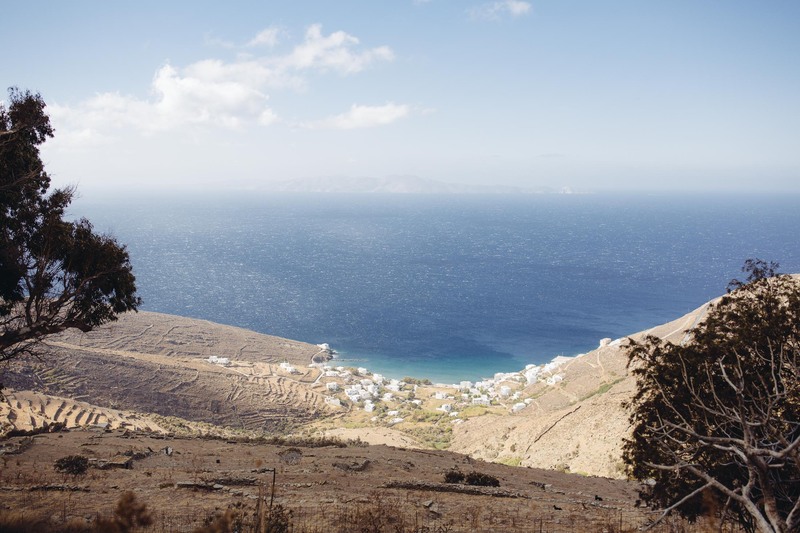 This island is no secret; pilgrims have been coming for centuries to visit the miraculous icon of Mary in the main port town, but for those seeking another kind of miracle Tinos is just starting to come into focus. From its ancient stone terraces to its sparkling blue water and marble seabeds, its dozens of sleepy villages and its lively fishermen’s tavernas, Tinos is the Cycladean dream we had always hoped to find. 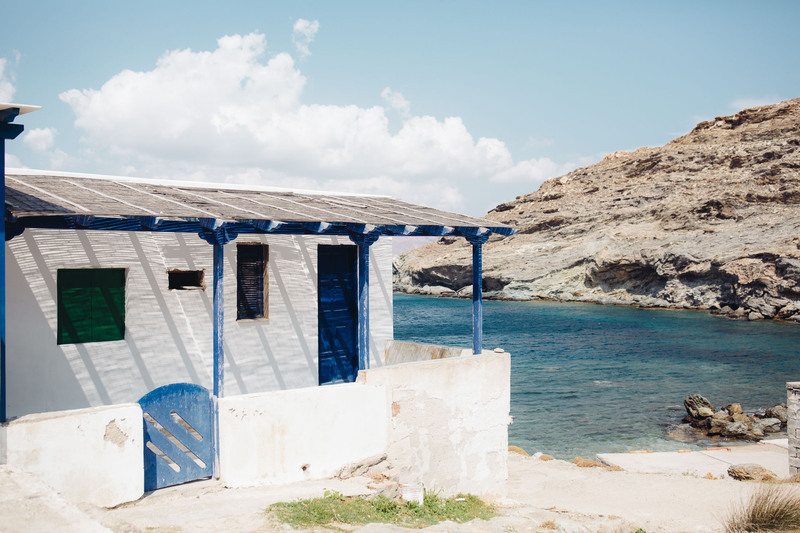 We can’t wait to catch a boat to Tinos with you this summer. WEEK 1 OR WEEK 2? : The only difference between the two weeks is the property where we’ll be staying. The first is a series of three villas, each with its own living area, kitchen and infinity pool overlooking the Aegean. You’ll share a villa with another family, and float back and forth between your lodging and the main house, where we can swim in the big pool, hang out and prepare meals together. This property captures the stark beauty of Tinos in a wonderful way, isolated on the side of the mountain, with nothing but stone and sea in all directions. The second week we’ll be hosted at a single, larger villa. There are 8 bedrooms, indoor and outdoor kitchens, private spaces to get away and larger communal spaces for hanging out together. The swimming pool is nestled into the side of the hill overlooking the tiny village of Isternia with its taverna and cafes just a few steps down the path. There’s a crescent shaped, sandy beach perfect for swimming right down the hill. WHO IS THIS TRIP FOR? : Our families come from all over, with all kinds of backgrounds, but they share a few important features: curiosity, open hearts, gratefulness as a practice, respect for the culture and the landscape in the places we visit, deliberate and thoughtful parenting. THE QC FAMILY GATHERING: We’ll join together for a Family Dinner at the long marble table in an abandoned quarry, where blocks of stone were shaped and rolled to the ships waiting along the quay a hundred years ago. As on many islands, the food on Tinos is intensely local. We’ll gather vegetables, goat and sheep cheeses and sausages from the small farms dotting the island and explore some of the recipes that make this such a wonderful place to eat. 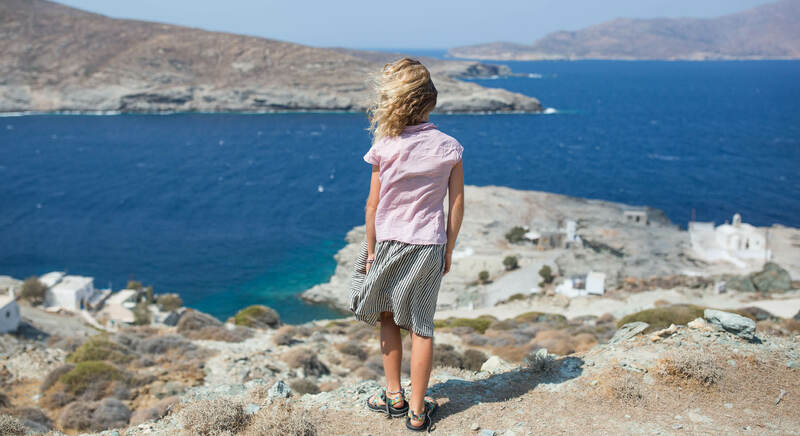 Tinos is made for exploring. We’ll visit a new corner of the island every day, and you are welcome to venture out on your own or join others for the experience. -Take a trip to the Saint Sea, with its calm cove and gentle, sandy beach. Hike around the corner, past the shrine of Saint Nicholas and watch the waves claw at the windward edge of the island. The brave can ford the isthmus to the island of Planet and its centuries-old lighthouse while the rest swim in the small pool beneath the wild, carved face of Aeolus, the ancient god of the wind. Have dinner at the island’s most celebrated restaurant, built directly on the quay in a tiny fishing village. Enjoy an inventive perspective on Greece’s fabled cuisine and pick up our feet when rogue waves wash across the stone floor of the open dining room. Travel by car down a dirt road, cut through mountains of jagged green marble to a hidden cove, visited only by the fishermen who keep their boats in aging boathouses at the back of the pebbled beach. The seafloor here is slabs of the same green marble from the mountain above, softened and worn by the waves. Take a trip to some old vineyards to learn how young winemakers are bringing the good juice out of these stones, and how they keep goats from ruining the whole thing. -Walk through some of the most picturesque hillside villages on the island, with their marble passageways, small tavernas and bustling squares. We’ll introduce you to the best spots for coffee or a beer, or ypovrichio, the sticky, sappy “submarine” aperitif served on a submerged spoon. DATES: Week One July 1 to July 7. Week Two July 15 to July 21. 1. QC Explorers Club: Stay with us in the villa, with private space for you and your family and communal areas to join as a group. We’ll welcome you with a happy hour and dinner on your first night, provide breakfast daily and help you plug in to the magic of this incredible island. Every day we’ll be visiting a new corner or special spot, and you’re welcome to join. Take a special seat at the table for our Family Gathering dinner in the abandoned marble quarry. Pricing for Week 1, July 1-7: €1810 for a one child/one parent family. Additional adults: +€375. Additional children: +€175 each. Price based on a single room. Additional rooms available. Pricing for Week 2, July 15-21: €1554 for a one child/one parent family. Additional adults: +€375. Additional children: +€175 each. Price based on a single room. Additional rooms available. This includes lodging for 6 nights in one of Tino’s most exclusive villas, a welcome happy hour and dinner, daily breakfast, access to the QC Black Book, and seats at the table for the QC Family Gathering dinner event. What’s not included: Flights, transport, gratuities, meals and drinks except where indicated, auto rental, activities. 2. Family Gathering, à la carte: Join us for a magical evening of dinner, wine and conversation. We’ll set the long, marble table in an abandoned quarry near one of our favorite beaches and work with some incredible producers and chefs to create an evening we’ll remember for the rest of our lives. Book your lodging wherever you like on Tinos and join us when you can. 3. 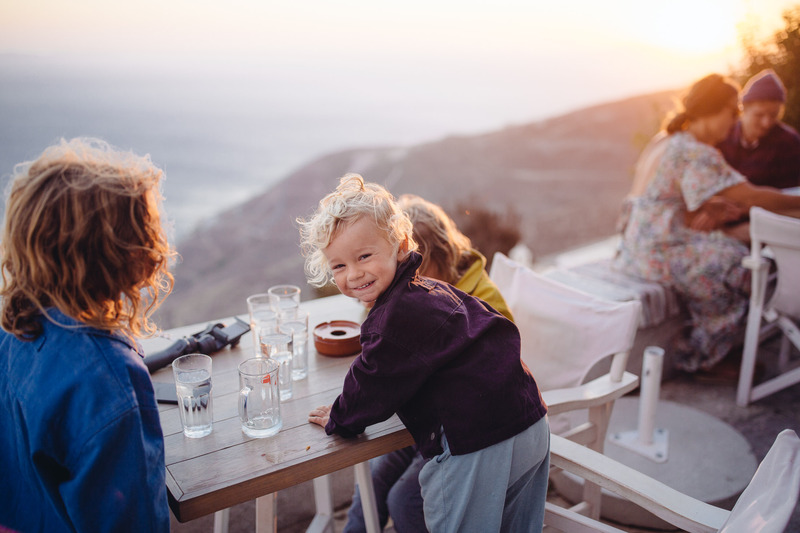 QC Full Service: Let us plan your family holiday in Tinos. You choose the dates and the budget. From top to bottom, we’ll make sure you get the best prices, the accommodations that we love and the experiences that we’ve hand-picked to help you get the most out of your time on the island. We’ll plan your flights, book your car and lodging, get you the reservations you need and hand you a list of suggested activities and contacts, including our QC Black Book. And if your trip coincides with one of our Family Gatherings we’ll save you a seat at the table. Price: Starting at €1000, depending on number of families. Reserved tickets to the Family Gathering dinner available for additional purchase. *All prices are in Euro. HOW TO GET TO TINOS: Option 1 -Fly to Athens, then take a 2.5 hour ferry directly to Tinos. Option 2 -Fly to Mykonos and take a 15 minute ferry to Tinos. For queries please email info@quartiercollective.com. We would love to see you in Tinos!